You can view the summary of your exercise after you have stopped recording. Keep Start Stop pressed to stop and save the exercise. Alternatively, you can press Start Stop to pause the recording. After pausing the log, confirm stopping by pressing Back Lap, or continue recording by pressing Light Lock. After stopping the exercise, save the log by pressing Start Stop. If you do not want to save the log, press Light Lock. Press Next to view the exercise summary. You can also view the summaries of all your saved exercises in the logbook. In the logbook the exercises are listed according to time and the latest exercise is shown first. 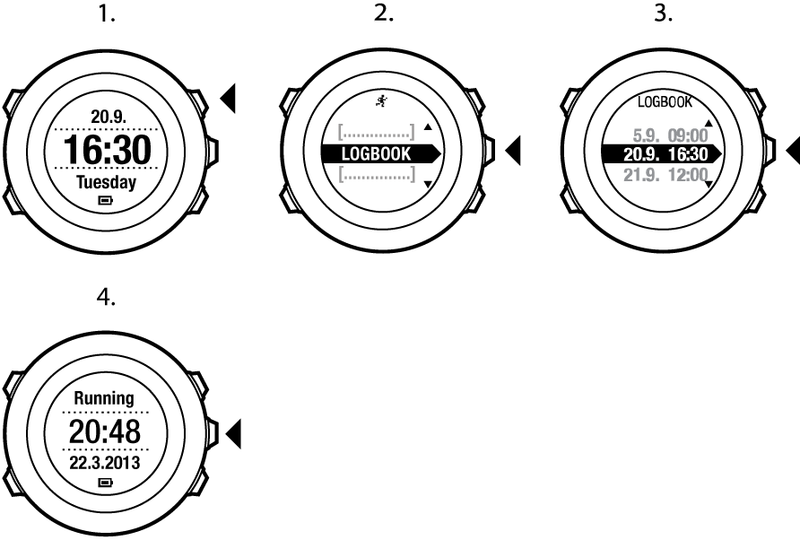 The logbook can store approximately 15 hours of exercises with the best GPS accuracy and 1 second recording interval. Scroll to Logbook with Light Lock and enter with Next. Your current recovery time is shown. Scroll the exercise logs with Start Stop or Light Lock and select a log with Next. Browse the summary views of the log with Next. If more than 50 % of the watch memory has not been synchronized, Suunto Ambit2 R displays a reminder when you enter the logbook. 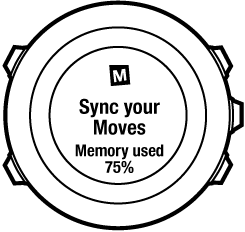 The reminder is not displayed once the unsynced memory is full and Suunto Ambit2 R begins overwriting old logs. The dynamic exercise summary shows the active fields from your exercise as a summary. You can browse the summary views with Next. The information shown on the summary depends on the sport mode you used, and whether you used a heart rate belt or GPS. If you select cumulative ascent/decent as a display option, the data will only be shown if you have also selected best GPS accuracy. For more information about GPS accuracy, see GPS accuracy and power saving. You can access more detailed data in Movescount. Suunto Ambit2 R always shows your current cumulative recovery time from all your saved exercises. The recovery time indicates how long it takes for you to fully recover and be ready to exercise with full intensity. As your recovery time decreases or increases, the watch updates it in real time. Scroll to Logbook with Light Lock and select with Next. The recovery time is shown on the display. The recovery time is shown only if it is longer than 30 minutes.